37 weeks – baby’s cooked, now to stop work! 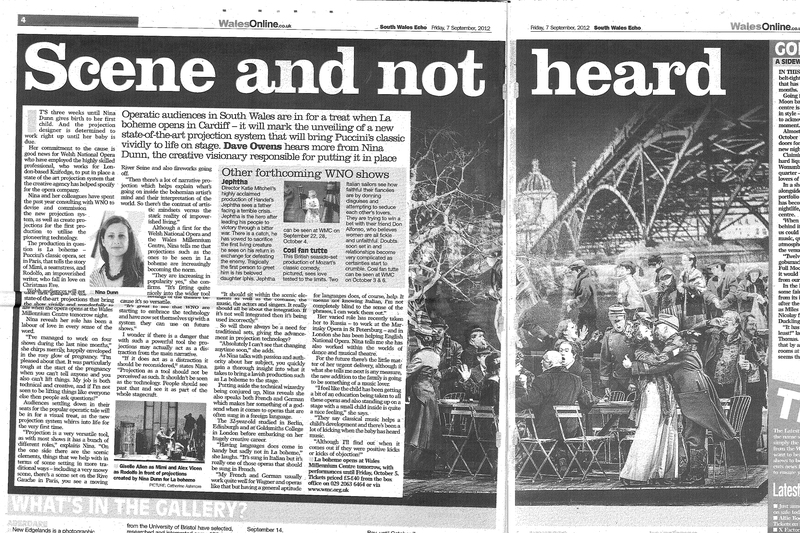 Fist up, if it wasn’t clear to the world that I’m going to be taking some time off over the next few months, looks like Wales is now in the know with the appearance of this recent article on WNO’s La Boheme. It’s a nice publicity shot but maybe a little too pre-occupied with ‘pioneering’ the projections are and how much I’m about to have a baby. On other matters, I officially finished work last week although I have been tying up some ends from home, attending a trade show and seminar, troubleshooting La Boheme from afar and have I one more fixed commitment – a meeting tomorrow morning – then I can really hunker down and do some satisfying DIY and bumbling. It’s amazing how tired I get when I’m out and a bout meeting people. I think it’s not so much that I can’t work as it is that the work feels wrong in my bones. My hormones are telling me to nest so anything that isn’t associated with that wears me down. How very strange. It is possibly a good thing that I have these odd bits of work to do and I will likely continue with some light activities over the coming week, taking me up to two weeks before my due date as it may prevent me from loosing my mind to babydom and/or spending yet more money and/or becoming lethargic and depressed BUT I am conscious that I do really need to make sure there’s a clear window before the child arrives as this free time will NEVER happen again!